Sort of like the girl that got a snowball facial in a Vodaphone ad, this web ad for the upcoming move, The Fog, doesn't exactly steer clear of sexual innuendo. In fact, it appear to be quite blatant about it. But, then that's just us. Or is it? What do you see in this ad? 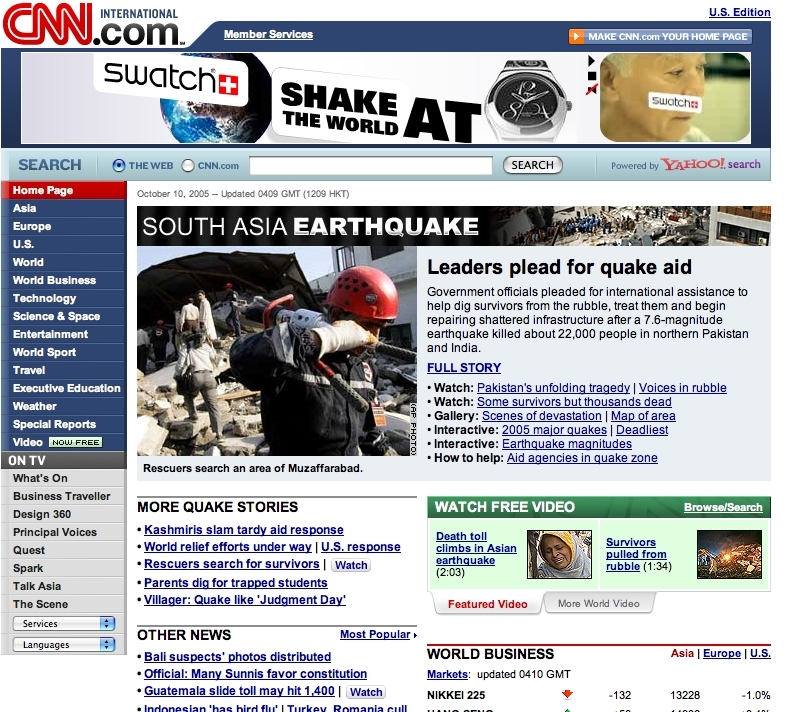 In another clear sign contextual advertising and natural disasters don't mix, a Swatch ad above a CNN lead story, yesterday, about the South Asia earthquake read, "Shake the World at," followed by the image of a watch. Oops. Did Swatch predict the time of the earthquake? There really ought to be better controls in place for this sort of thing. 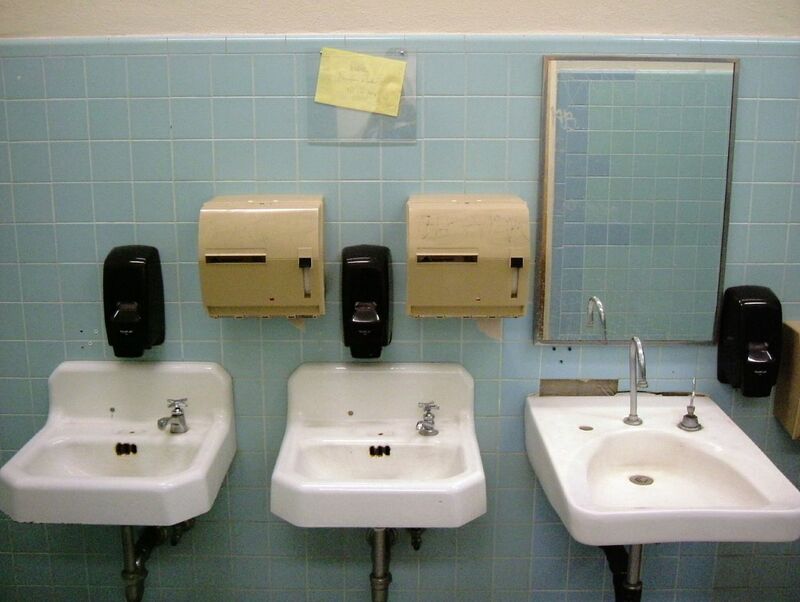 Not that there's anything new about bathroom advertising but this handwritten note, which reads, "Website Designer Needed 310-270-3636," placed inside a plastic sleeve and attached to the wall above the sinks is a bit different and unique. Obviously, the number leads to an answering machine because who wants to listen to thousands of people calling just to see if the gig is real. In any event, someone is in need of a website designer. In her daily RocketBoom Vlog, the very attractive Amanda Congon, takes a look at some of our favorite advertising oddities such as the Honda Cog commercial, the Cog's spoof, the Homespun HP Photo commercial and Fidel Castro talking about beer. Very weird. Very strange. Very cool. Called Great Pointed Archer, this is-this-a-joke-or-not site aims to come to the aid of the lowly rat claiming they are a species, like humans, who are just trying to get through life as pleasantly as possible. The site contains rat facts, an "Archer Dash" game, humorous PSAs, a store with rat goodies called GPA - which strikingly resembles the GAP and a petition calling for the replacement of the term "rat" with "Great Pointed Archer." Negating the pain and suffering hurricane Katrine caused, to idiotic Louisiana lawyers are attempting to capitalize on recent events by requesting a patent for alcoholic drinks bearing the Katrina name. Andrew Vicknair and Harold Ehrenberg are the two kooks who applied for the patent September 4 which included a logo with the name Katrina, a satellite image of the hurricane and the tagline "Get Blown Away." Harold's website, on which he also refers to himself as a chiropractor might explain this weird move. Chainsaws and Gucci are not exactly two things you'd find associated with one another unless, of course, there's an artist involved as Spunker points out. 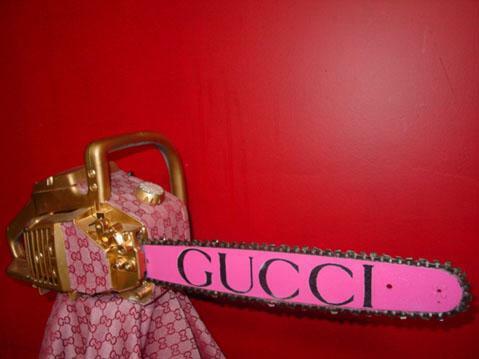 In this case, it's Peter Gronquist who's taken a chainsaw and given it a Gucci makeover. Gronquist has a history of creating whacked-out brand placements. 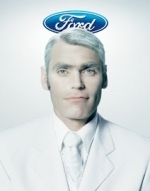 Ford Belgium has launched a speaking ad campaign, called Ford Miracles that, well, speaks. And we're not talking about TV or radio. Created by Ogilvy Belgium and consisting of outdoor posters and customizable e-cards, the ads say, well, something. We don't really know what because we don't speak French or whatever language is spoken in Belgium. The campaign site even has a live webcam that is mounted to one of the posters to monitor viewers reactions. It's a bit spooky. UPDATE: Jason Vines, the man behind the The Firehouse weblog didn't like what we had to say and commented on another blog about it. Additionally, he explains the motivation behind the launch, which does make sense. Read his commentary after the jump.